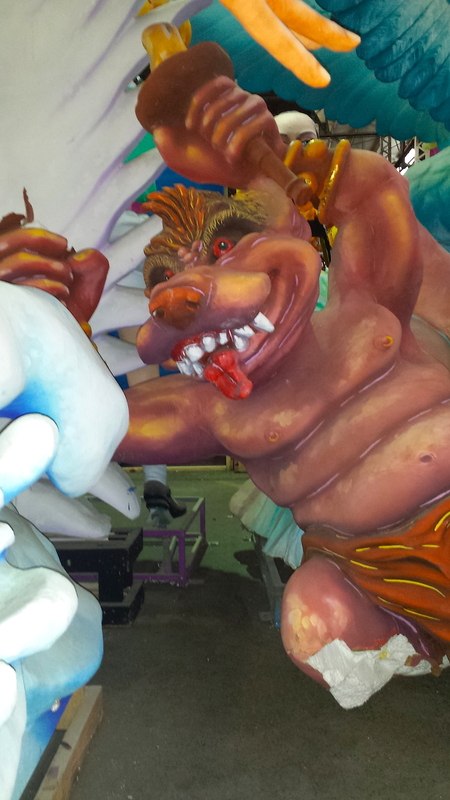 If you visit New Orleans, see the anthropomorphic sculptures at Mardi Gras World. New Orleans is a renowned party town. 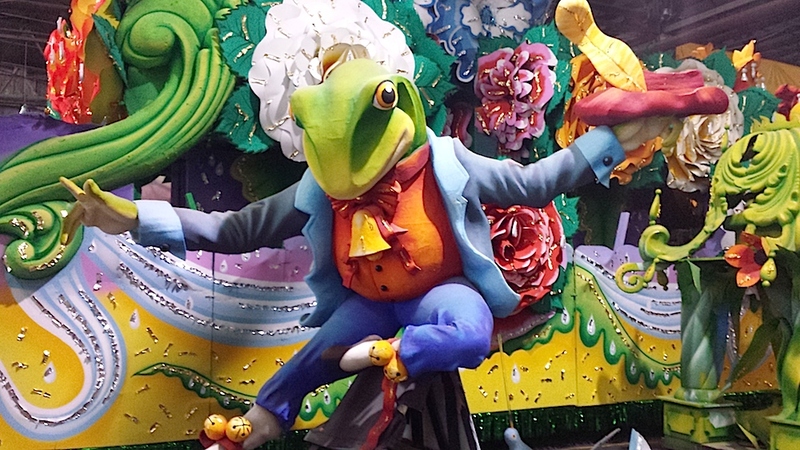 In the French Quarter, on Bourbon Street, you can get potent drinks like a Hand Grenade or a Resurrection in to-go cups, and walk around the neighborhood as boldly as you dare. 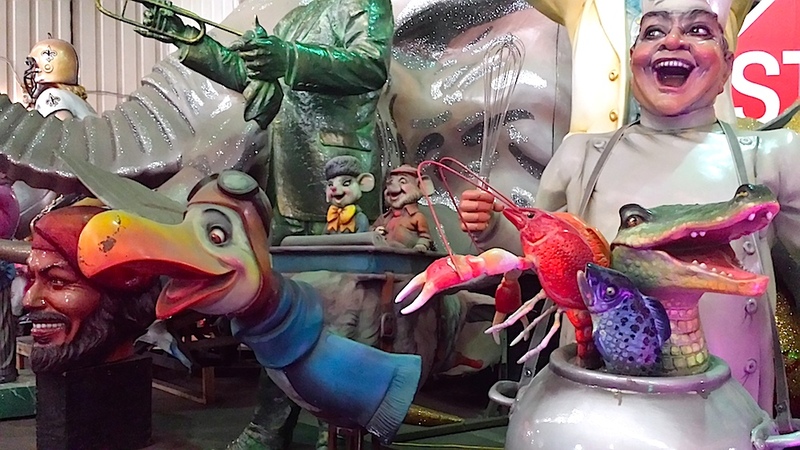 A walk into some of the restaurants can make you sneeze, because the crawfish boils have so much seasoning, that it pervades the air like a whiff of pepper spray at a crime scene. Signs on murkier streets warn you to walk with friends, and be vigilant. Petty crime seems taken for granted in a place scarred by hurricane Katrina a decade ago. People party to forget woes or live life to the fullest with reminders of mortality all around. (At least that’s an excuse for barfing out the door of a taxi.) There’s many stories about long ago lives held in above-ground mausoleums of famous cemetaries. A tour is a nice calm way to walk off too many drinks, even if guides will tell you any kind of silly ghost story for tourist bucks. 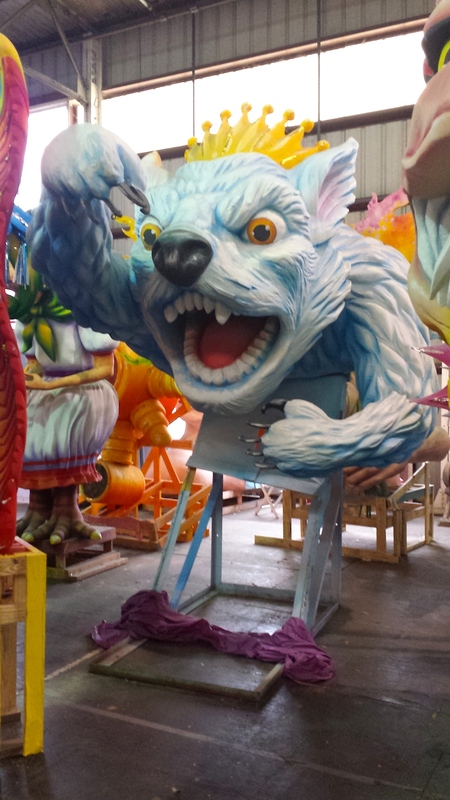 The first Blue Dog painting, Loup Garou, was inspired by Roderigue’s dog Tiffany who had passed away, in combination with the werewolf-like, Cajun mythological creature, the Loup-garou. 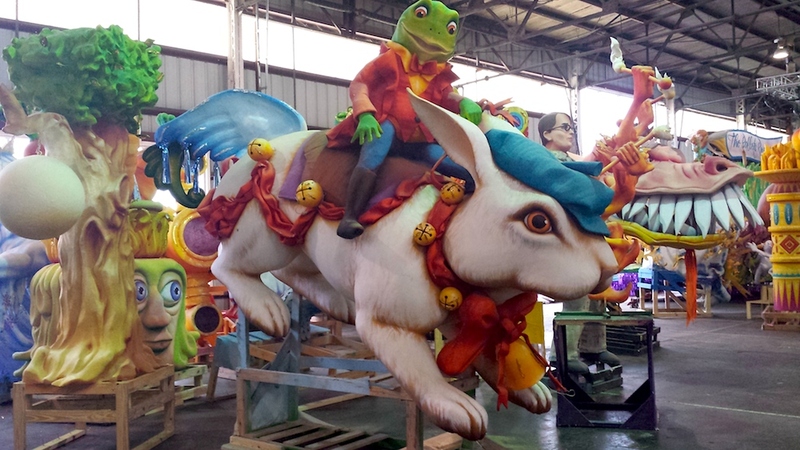 Furry connections: I’m not sure if furries are very active in New Orleans, but the art and parties makes one big attraction for a furry visitor… or for anyone who wants to see behind the scenes of impressive fantasy creativity. 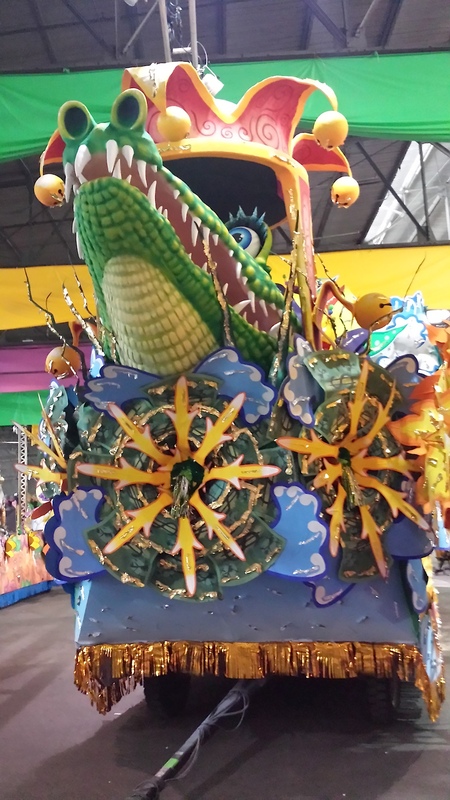 Mardi Gras World is one of fourteen giant warehouses owned by Blaine Kern Artists. They set it up as a tourist attraction in 1984. It’s a working production facility, so the tour experience is real. 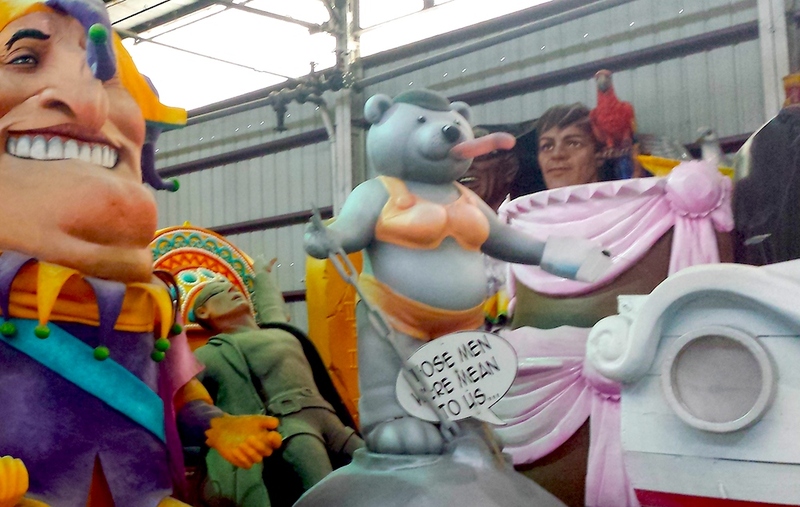 They start off by showing you a video about parade float building. There is old history behind the “Krewes” who sponsor and promote them, (social groups that hint at Masonic mystical secrets). Then you get to watch builders at work. 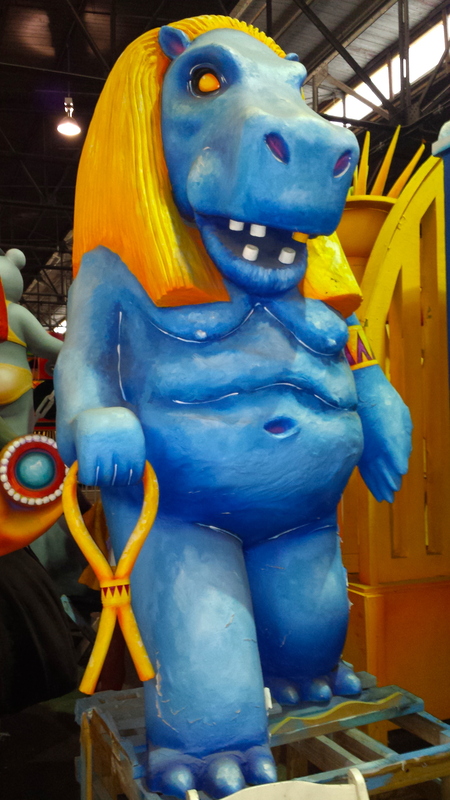 I haven’t actually visited at Mardi Gras so I had no idea how much attention to detail they give the sculptures. 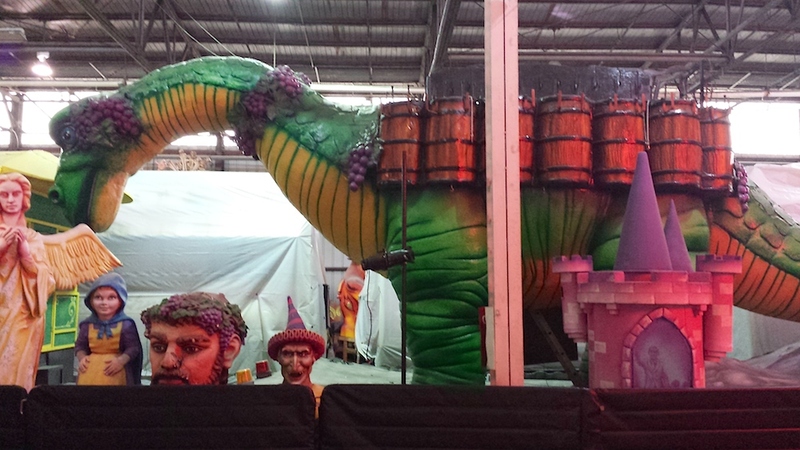 It gets way more elaborate than other parade activity I’ve seen. (Although, it seems smoother and more industrially-efficient than Burning Man type activity I’ve seen). Holy cow, these art works are big! 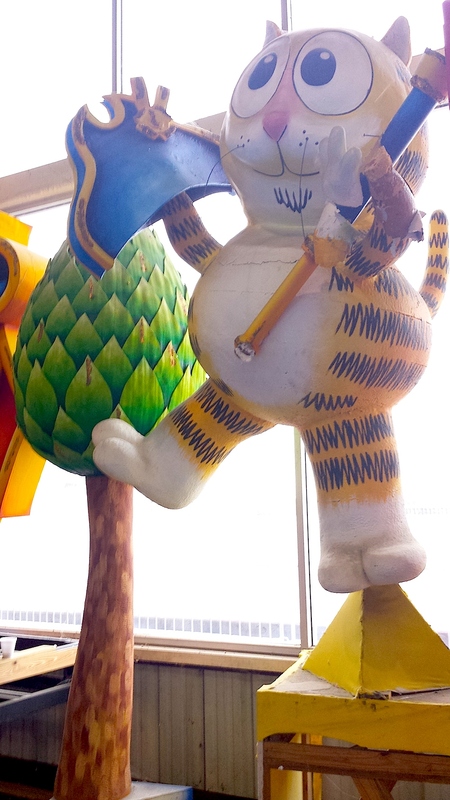 They’re made of smooth-varnished papier mache, so they look solid, but don’t get too heavy to transport. 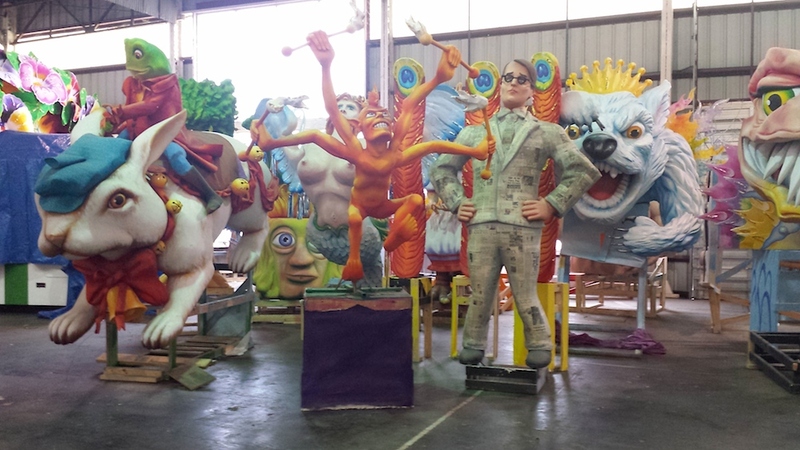 They’re made for Mardi Gras – but also for casinos, Disney World, and more, with international respect for the skills. 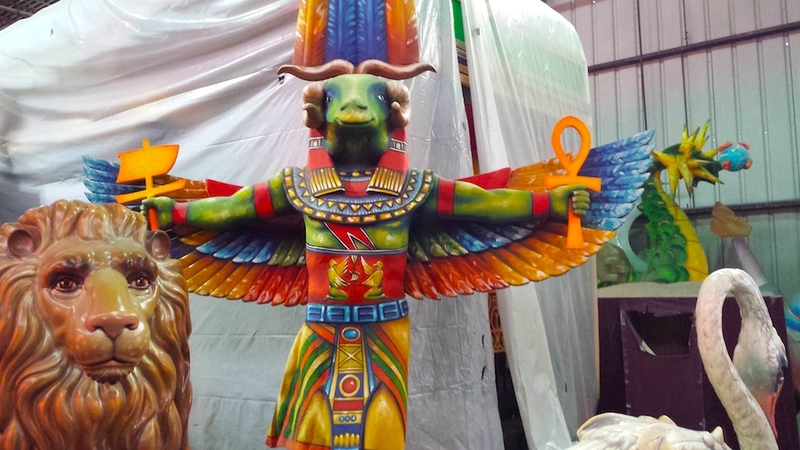 Imagine having something like these for Furries in a parade. (At San Francisco Pride, we ride a plain truck with banners on it.) The last few year’s successful Furry events at Pride raised talk of buying a truck to decorate as a mobile event platform. 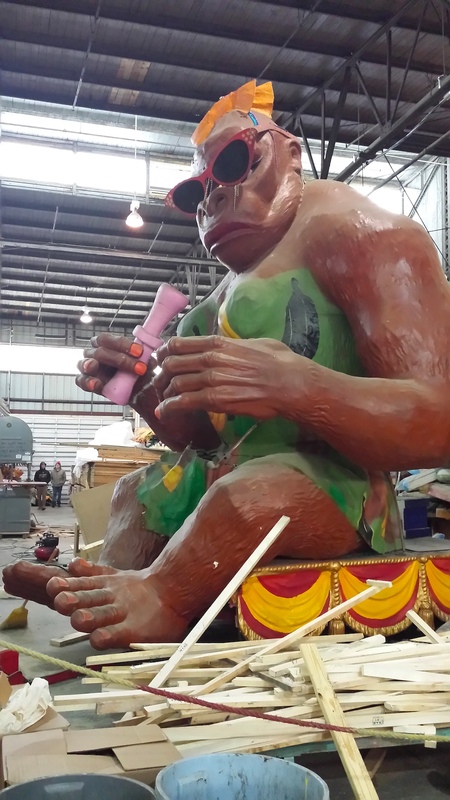 I can see a furry event truck being part of Camp Fur at Burning Man. As a 15 year old furry native to new orleans, I can verify that pretty much all of this is true. 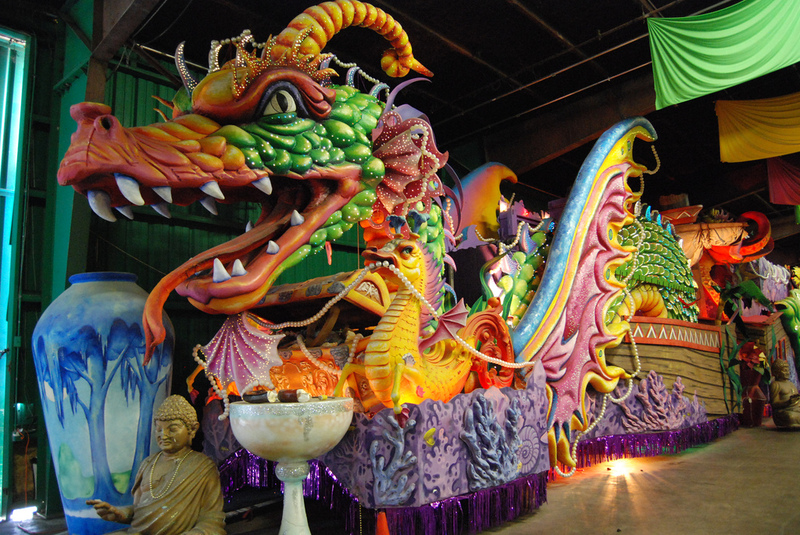 In elementary school, we once took a field trip to Mardi Gras world. I have yet to see any other furies around and it would be awesome if someone messaged me! From what I have seen, since I my self am a local furry to belle chasse (a town near new orleans) this all is true only thing is if you think of moving here, well there are no furries near new orleans, only in plus it seems from reasearch i have done im the only furry in all of belle chasse (the biggest town near new orleans).